The name Rick Johnson is familiar to motocross fans everywhere. There is a different Rick Johnson, however. This Rick Johnson owns Too Tech Racing here in Southern California. He has been racing motocross, and tuning suspension, for decades, now. He has a loyal following in Southern California, the hottest off-road community in the world. We had Too Tech tune the forks and shock on our 2002 RM250 test bike. As reported in the initial review of the RM250, the stock suspension is quite good, but it could use improvement in a few areas. Specifically, some harshness on braking and acceleration bumps tend to wear out the rider more quickly during a moto, and there was a slightly unbalanced feel between the front and rear of the bike. 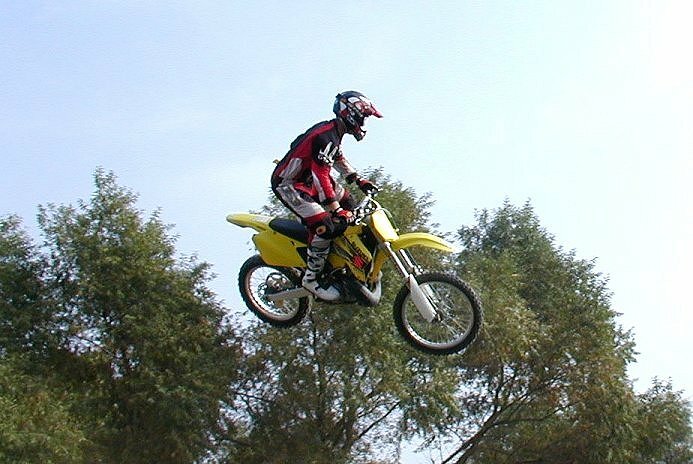 Overall, the stock, 2002 RM250 suspension is quite good, but we asked Too Tech to make it better. The stock spring rates are actually pretty good for riders up to 170 pounds. Faster riders would probably want stiffer springs in the fork, but the stock spring rates work for most mortals in this weight range. The stock valving in the fork was changed by Too Tech to make initial movement of the fork from its static position easier (more plush in the initial part of the stroke), while making the rest of the stroke more progressive. The stock fork rebound valving was pretty close to perfect, in Rick’s opinion, and he only made a small change there. In the rear, Rick found the stock valving overpowered the fork by holding the rear of the bike too high. He addressed this by reducing mid and high speed compression damping, which resulted in a more balanced suspension front to rear. Rick also thought the shock needed work on the rebound valving, with the most significant change being adjustments to allow the shock to rebound quicker in the top three or four inches of its travel. Overall, Too Tech’s work on the fork and shock of the RM250 took very good stock suspension and made it excellent. The bike felt more balanced, sharp hits were absorbed much better, and the wheels simply followed the terrain under a wider variety of conditions. Unlike many suspension tuners, Rick Johnson is actually an engineer. Take a look at some of the technical information he provides on his web site. We hope to do future projects with Rick and Too Tech.